'All the world's a stage, And all the men and women merely players', so said William Shakespeare over 400 years ago. It's a saying that still rings true – the art of performance, whether on stage or off, has entranced people for centuries. And while the artistry of the performers should never be called into question, there's undoubtedly something special about these stages. Built in 1778, La Scala is one of the oldest opera houses in the world. The auditorium was originally illuminated with 84 oil lamps, with another thousand lighting the rest of the theatre. With pre-electric technology however, came increased risk of fire and so buckets full of water were hung on the walls around the auditorium. King Gustave III turned away the French Opera Troupe in the years before The Royal Swedish Opera was built because he wanted to create an opera house that could perform Swedish productions. The Kungliga Operan was constructed next to the Royal Palace on the Norrström River and so the national home of opera and ballet was born. In a cruel twist, the king was actually murdered at his beloved opera house; he was shot at a masked ball in 1792. The assassination would later inspire Verdi's Un ballo in maschera. Teatro Colón was built in 1857 as a performance venue for overseas companies stopping in the Argentine capital. It was nearly 70 years before the theatre saw its resident opera and ballet companies established. The interior design echoes the European style, but the ceiling was repainted by Argentinian landscape painter Raúl Soldi in the 1960s. His inspiration was the South American sky. Philanthropist John D. Rockefeller III was part of the 1950s initiative to create a new cultural hub in New York. He reportedly raised more than half of the $185 million need to build the complex. The center features a huge variety of dance, music and film performances and is home to The Metropolitan Opera and the New York City Ballet. Surviving both revolution and fire, the Bolshoi Theatre has been rebuilt several time during its history. Its iconic facade can be seen on the Russian 100 ruble banknote. The theatre was closed for six years in 2005 for some serious renovation work that was said to have cost upward of 25.5 billion rubles (£650 million) and during this period, performances were held at the Great Kremlin Palace. The Bolshoi Ballet regularly perform at Covent Garden as part of their London Seasons. Glyndebourne Opera House is in the grounds of an English country house beside the South Downs in East Sussex. Its famous summer festival has happened every year since 1934 – apart from a brief closure during World War II. Works are performed in the purpose-built opera house (rebuilt in 1994), but much of the day is spent outside, where audiences are encouraged to dress up in black-tie and bring a picnic to enjoy in the garden. Inspired by the ship sails that sail Sydney Harbour, the city's famous opera house is one of the most iconic buildings in the world. More than 8 million people visit the theatre to marvel at the concrete shells designed by Danish architect Jørn Utzon - visitors can even climb them on a tour. Following a dispute with other stakeholders during the build, Utzon left Australia never to return. He famously never saw his masterpiece in its completed state. The Paris Opéra perform in two very different spaces in the French capital. Built in the 19th century, the Palais Garnier is the older of the company's two theatres, and has become an important landmark in the city alongside the Notre Dame and the Louvre. The second site Opéra Bastille, now the main facility of the Paris National Opera, was designed to provide a ‘populace and modern’ space for audiences. The Salle Garnier was designed by the same architect who created the Palais Garnier in Paris. Monaco’s version is much smaller, seating only 524 compared to the Parisian version which can seat an audience of over 2,000. The Salle Garnier was used to celebrate the centenary of Monte Carlo by King Rainier III and his American film star wife, Grace Kelly. Said to be the oldest ‘continuously active’ public opera house still in existance, Naples is home to the oldest horseshoe shaped auditorium in the world. Rossini, Donizetti, Verdi were all composers in residence here. The interior inspired subsequent opera houses around Europe and includes gold decoration, sumptuous blue upholstery and 184 boxes. Home to The Royal Opera and The Royal Ballet, the auditorium of the Royal Opera House has been relatively untouched since it was completely rebuilt after a fire in 1858 (caused by a cannon misfiring on stage). The ROH will be getting some big improvements to its front of house spaces over the next two years, thanks to the Open Up project, so expect plenty of stunning photos of our new surroundings. We also hosted the first ballet-inspired Instameet, #BalletBeauty. 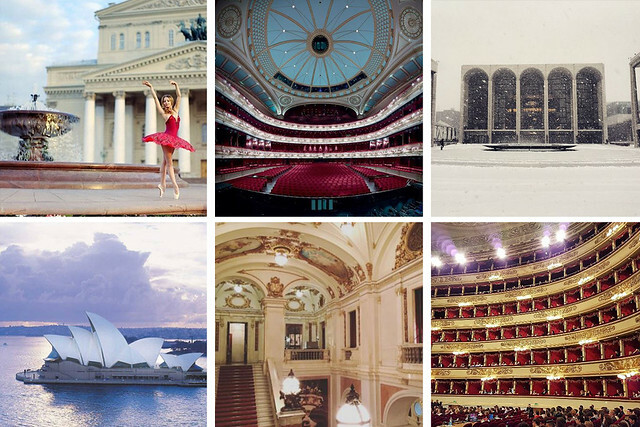 Which opera houses are you following on Instagram? Falta el Teatro Solís de Uruguay! Teatr Wielki - Polish National Opera (@operanarodowa) with a biggest stage in Europe! They publish a lot of behind the scenes pictures. "Great" as buildings for the purpose or the quality or quantity or variety of the productions and performances? The result will not be the same.